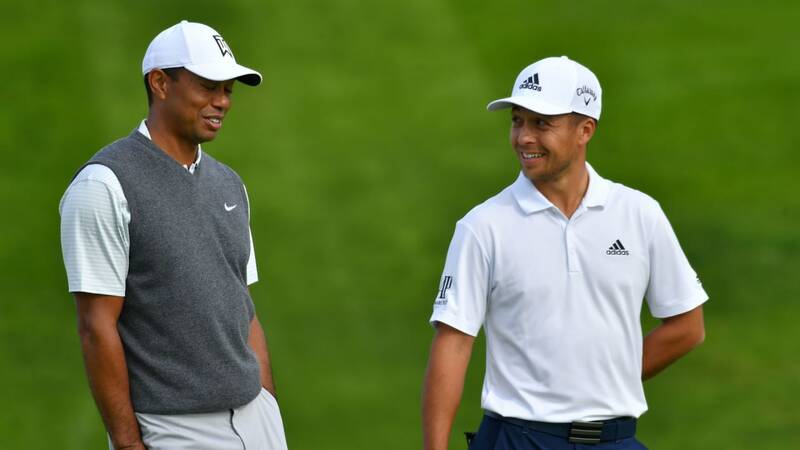 Xander Schauffele played with Tiger Woods for the first time. The first drive of the day for Tiger Woods was nothing short of great — long and straight. “Normally with an eight-iron in my hands that’s a green light but I didn’t want to make bogey on the first hole of he day so I dumped it in the middle of the green,” Woods admitted after his day’s work that saw him shoot two-under par 70 on the South Course at Torrey Pines. With all the low scores on the North Course, including a 62 by overnight leader Jon Rahm, Woods knew what was in store for him on Friday. “I’m forced to have to shoot a low score over there,” Woods said. His 70 wasn’t a bad effort. He managed to birdie all the par fives and had a lot of putts burn the lips. “I could have shot around 67 or 68,” Woods said, playing that game that most players will. Overall Woods said he struggled to get his “feels” going, struggled a bit with his yardage control on his irons. He was paired with Xander Scauffele and Tony Finau for the first time in a regular season Tour event. Both his partners nipped him by a shot. Woods did manage to outscore Rory McIlroy (71) and Rickie Fowler (73) on the South Course. “Overall I drove it pretty good today,” Woods pointed out and that will be the key for him on Friday. Jon Rahm said the key to his 62 was keeping it in the short grass on the North Course.